Grapefruit is available in abundance, both the local and imported ones. I prefer using the local pomelo. It tends to taste less bitter. The segments may not be as pink as the ones in the photo but I got lucky. If you like, you can use proper grapefruit. The tanginess of the grapefruit and sweetness from honey is a wonderful combination. Remove the membrane from the grapefruit segments. Tear the green leaves into smaller pieces if they are big. Whisk all the ingredients of the dressing together. 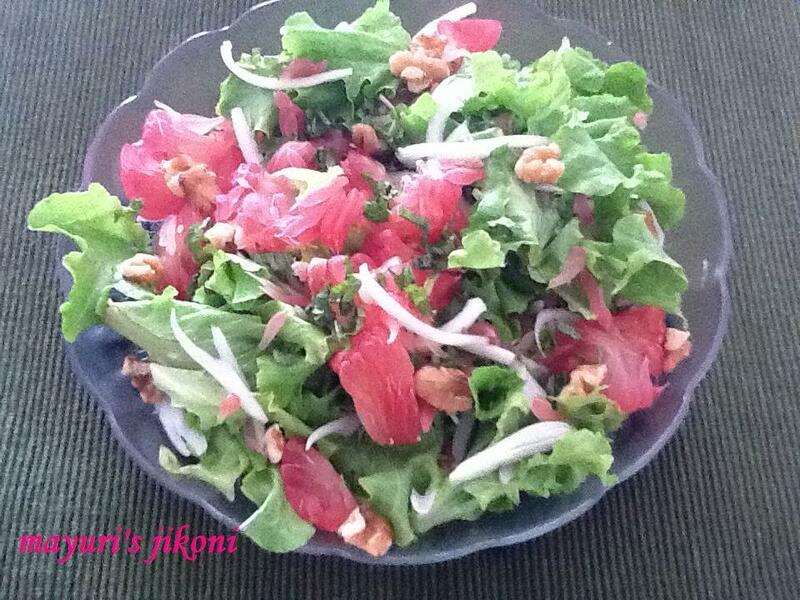 Put the grapefruit segments, walnuts, leaves, onions and mint into a serving plate. Drizzle the dressing on top and serve. I prefer to put the grapefruit segments in the fridge before adding to the salad. On a hot day a cool salad tastes yum. Can add nuts of your choice.